Every year, around 64.5 million people use Germany’s biggest hub to be successful in business around the world, to discover new countries or to visit their families and friends. We are experts when it comes to the ways and psychology in the travel process. This means we can help companies gain new customers with extraordinary solutions, promote sales or increase awareness of their brands. First Class in ‘Out-of-Home’: As the leading business hub, we offer access to influential, high-income target groups relevant for both B2B and B2C online marketing. To this end, we offer a wide variety of cross-media and digital marketing options in a high-grade setting, which you can choose and combine in accordance with your strategy. Jean Paul GaultierAirport Paris - Dream factory turns to virtual reality. VodafoneAirport Lissabon - The statement to the diversity and beauty of our continents ….and by the way you are able to charge your mobile device. Bad Homburg CasinoAirport Frankfurt - "Rien ne va plus" or the way a baggage claim has transformed to a roulette wheel. We at Sixt are full-blooded marketing professionals. We have been working closely together with Media Frankfurt for many years and share their passion for occasionally implementing crazy ideas at Frankfurt Airport. For years, we have worked closely in partnership with the professional team of Media Frankfurt. Given the necessity to conform with specific construction methods of the Airport Terminals, the Smoking Lounges have been a particularly complex project. In close collaboration with Media Frankfurt we succeeded in turning the project into a top-class concept. Good and constructive collaboration with representatives of Media Frankfurt GmbH. 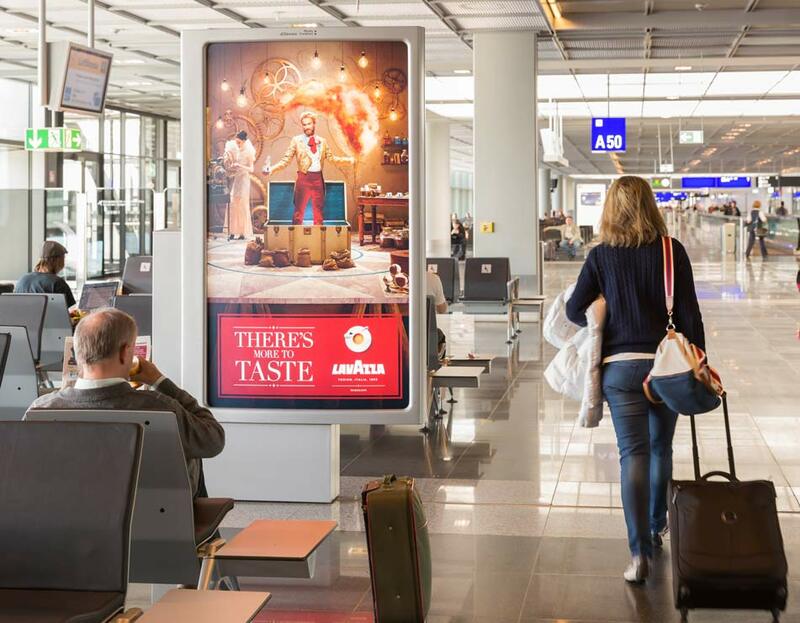 For Singapore Airlines, Media Frankfurt is a great source of ideas for attention-grabbing static and digital advertising at Frankfurt Airport. We particularly appreciate the highly collaborative working relationship. Very smooth planning, great commitment and excellent collaboration. Always available and solution oriented. Media Frankfurt understands our objectives and is able to create advertising solutions that attract the attention of our target groups. Production and installation of the Bayer cross advertising symbol was arranged flawlessly and efficiently by Media Frankfurt. 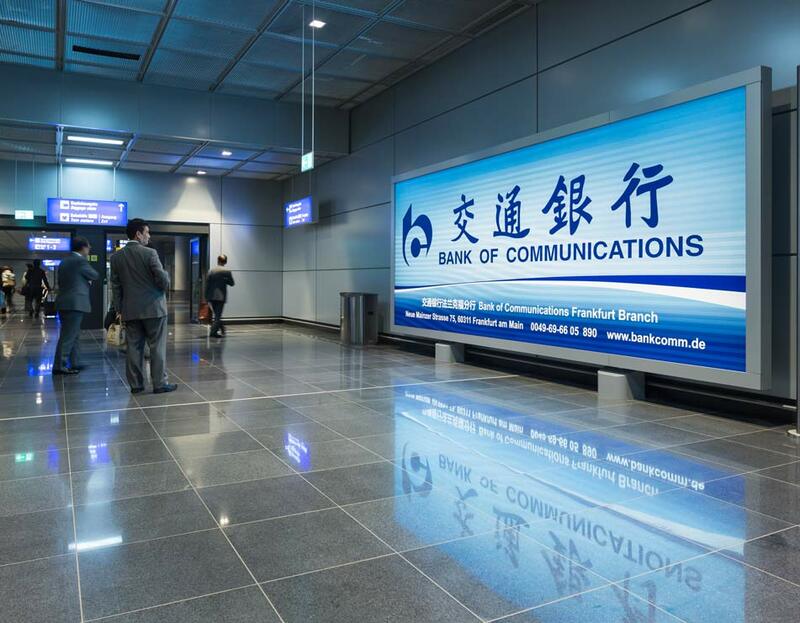 We have been cooperating very successfully with Media Frankfurt for many years. Particularly important and really helpful for us is that Media Frankfurt is a one-stop shop – from planning to production, everything runs smoothly and quickly, thanks to the open and transparent communication. We really appreciate this teamwork. Our high-quality digital networks and individual media accompany your target groups with moving pictures via relevant touchpoints along the travel process chain at the airport. Made to match. Comprehensive networks in the gate areas or gigantic mega posters on the outer wall - this media is distinguished by a huge audience and short booking periods. Whether product launches or image campaigns - add a special note to your advertising. We recommend genuine attention-grabbers which can only be found at the airport. Make it big. The XXL-formats in the outdoor area at the airport are unique and nowhere else you will find anything like them in terms of form, format and positioning. Supplement your strategic brand communication with intelligent services or spotlight your brand and product with interactive exhibition space. Find the mediafacts here. Experience our versatile and innovativ product portfolio. Register now and check in to the world of airport advertising.